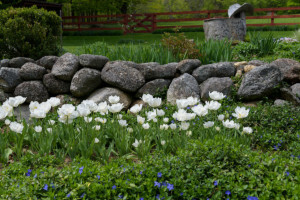 While growing these bulbs can be challenging, the rewards are great. Wicked Tulips Flower Farm is located on the historic Snake Den Farm. 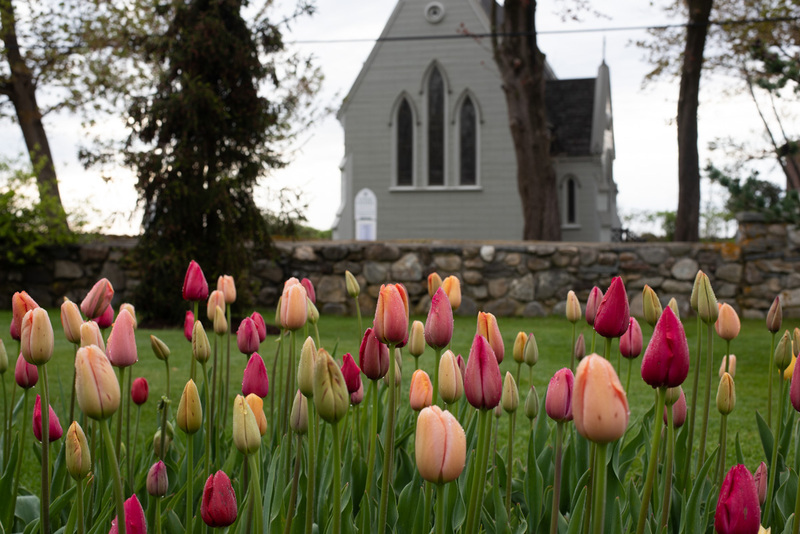 Owned by the State of Rhode Island, the farmland is leased to several small farming ventures, including Wicked Tulips, in an effort to keep the land open and productive. Even though they had been cultivated for centuries, tulips sparked a craze called “tulipomania” that swept through Europe in the 1600s with individual bulbs commanding astronomical prices. What goes up must come down, and when the market for tulips crashed, it rocked the Dutch economy. Speculation on tulips was the dot.com boom-and-bust of that time. Nowadays we are crazy for tulips because they signal the welcome end to winter and start of spring. 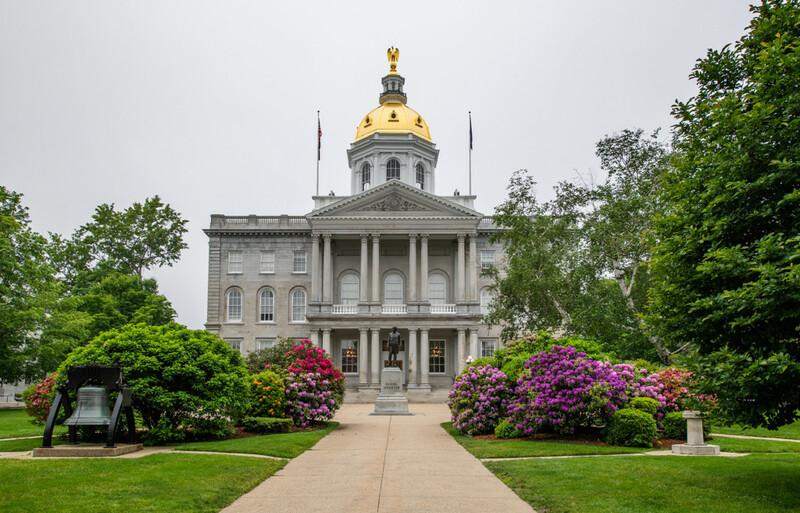 Unfortunately we are not the only beings in love with these plants and in New Hampshire, they are under assault from above ground and below. Deer love the sweet blossoms and chomp down the buds as soon as they appear. A multitude of rodents—including voles, squirrels and chipmunks—thinks nothing of digging through your garden beds, mining for the bulbs as if they were buried treasure and devouring them. Sliter has found various ways to protect the plants. 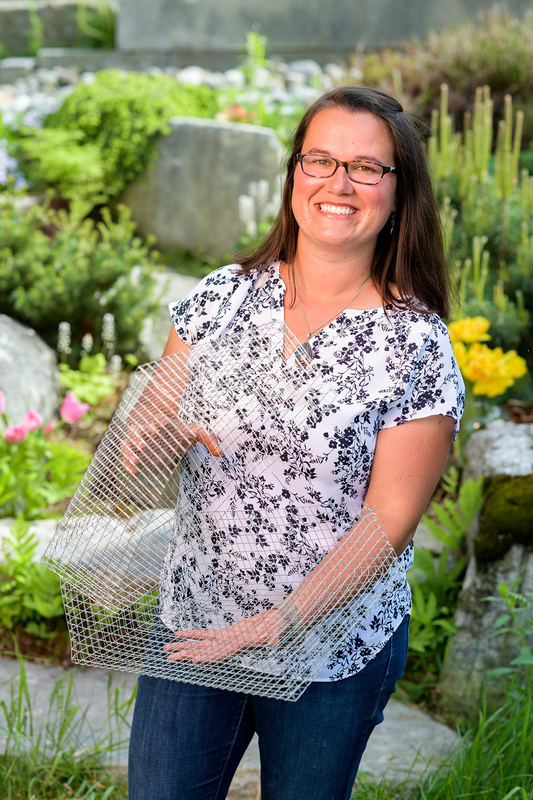 “To deter pests from eating the bulbs themselves, we have tried everything from planting them with garlic, blood meal, rock chips or pea stone, to wrapping individual bulbs in steel wool,” she says. With fluctuations in the populations of rodents and deer, Sliter has found tulips may perform wonderfully for several years and then, in a year of numerous chipmunks and voles, half—or more—of the tulips vanish. 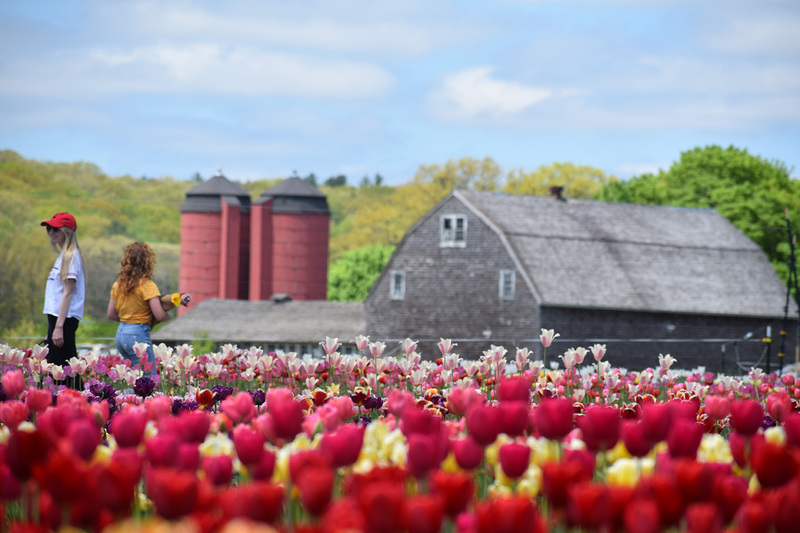 Late-season tulips at Fuller Gardens in North Hampton should be in full bloom for their season opening on Mother’s Day weekend. 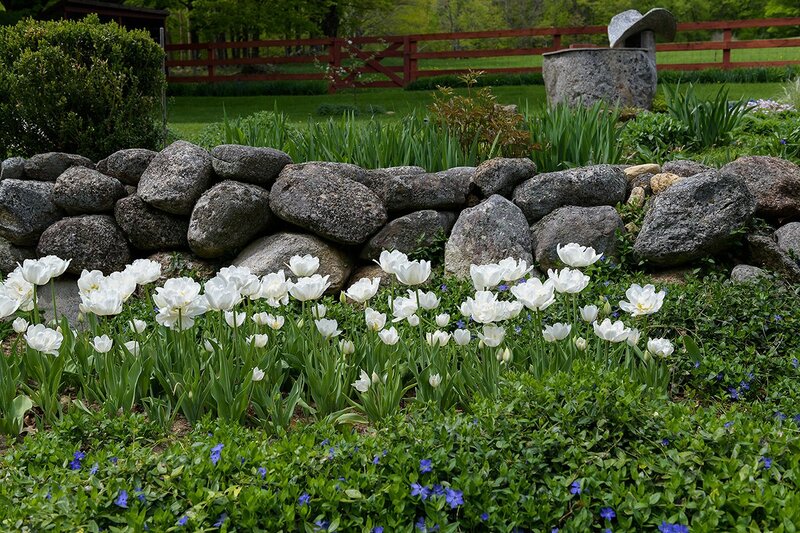 If you plant some tulip bulbs this fall, you’ll find a staggering number to choose from. 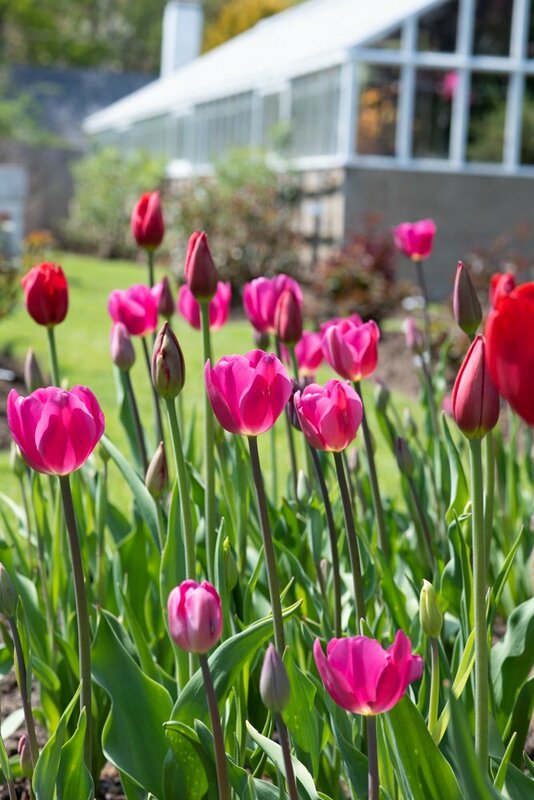 There are 150 species of tulips with more than three thousand varieties available. Sliter recommends heirlooms for their staying power. 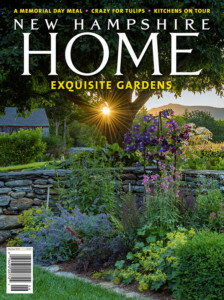 “Many bulbs bred in the horticultural world are not as hardy. They may bloom beautifully the first year, but not return the following year due to a number of reasons. Heirlooms are the toughest of the tough. These tulips have made it through different weather patterns, exposure to different insects and diseases, and are still able to grow and thrive today,” she says. 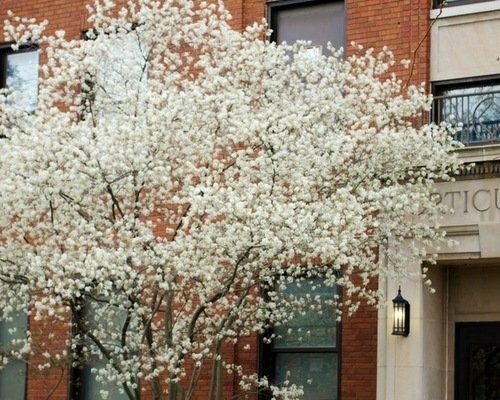 “With the proper protection, they will grow for a longer time.” A few of her favorites heirlooms are ‘White Triumphator’, ‘Greenland’, ‘White Parrot’ and ‘Rococo’ as well as petite species tulips, such as biflora, saxatilis and linifolia. There are nine beds—including the central one around the antique wellhead—planted with tulips. They will be a treat for your color-starved eyes! 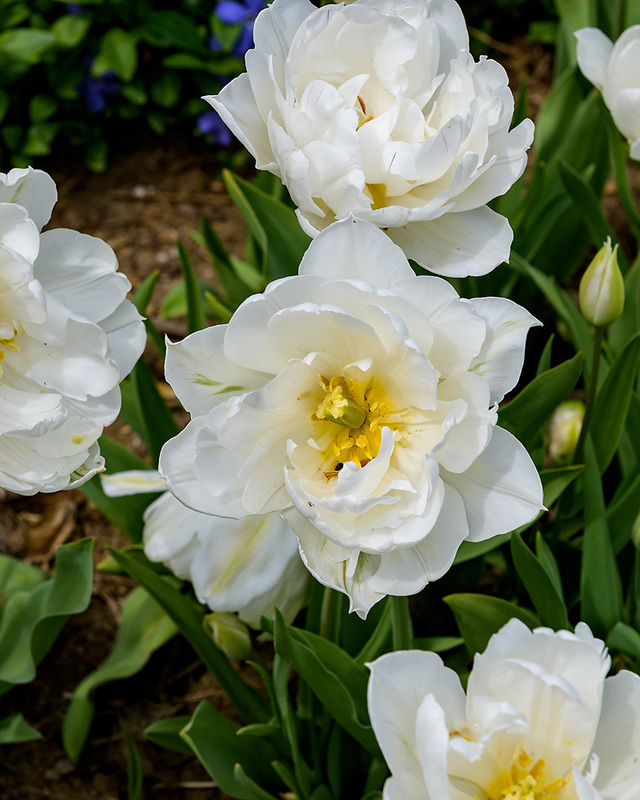 “We grow late-season tulips that typically are in bloom in early May, including red ‘Menton’, white ‘Maureen’ and a dark purple called ‘Queen of the Night’,” says garden director Jamie Colen. 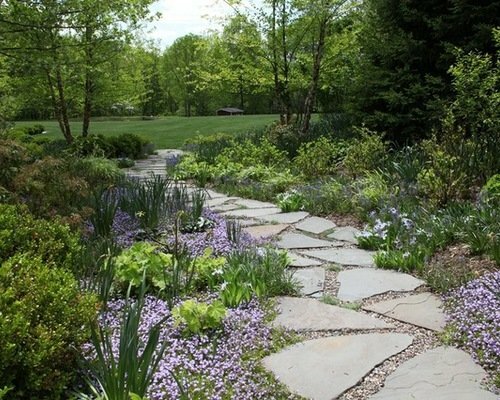 Even though the gardens are located just a stone’s throw from the ocean, they still are troubled by fluctuating populations of deer, voles, chipmunks and rabbits. “These pests feed mostly by scent, so anything you can do to make the plants unappetizing to them interrupts their feeding habits,” Colen says. “We have had great success spraying natural animal repellants that are made from putrefied egg solids.” These readily available products have a paraffin sticker mixed with the solution to keep it from washing away after rains. The spray is harmless to the plant, has no odor after it dries and can keep repelling herbivores for between six and eight weeks. The use of predator scents in and around your yard can also help fend off deer and rabbits. Colen also advises home gardeners to plant tulip bulbs late in the fall, just before the ground freezes to thwart rodents who may dig up and eat the bulbs. “It is all a matter of proper timing,” he says. 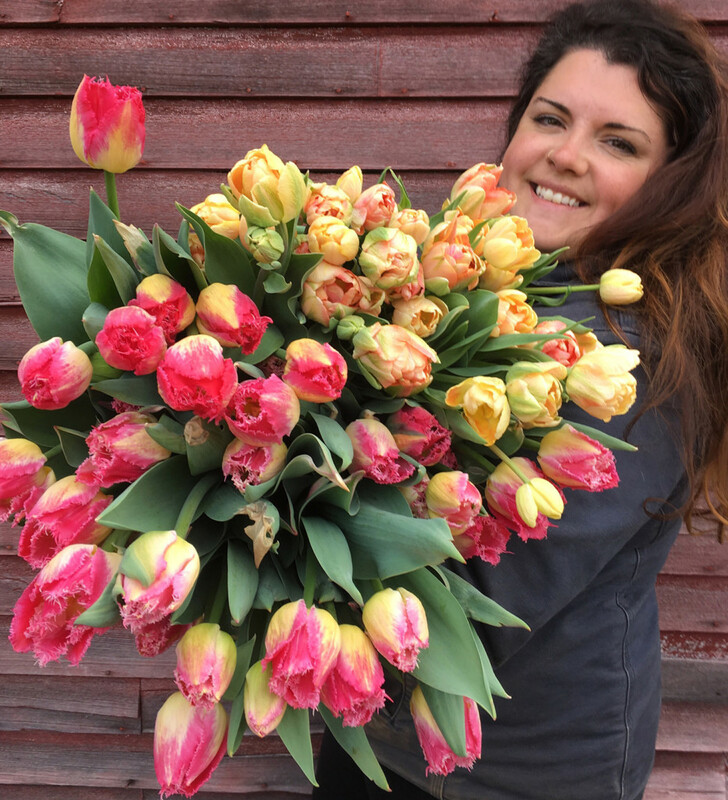 Vanessa Tarr, of Tarrnation Flower Farm in Sugar Hill, harvests armloads of tulips from her unheated greenhouse to create spring bouquets. Looking to bring the beauty of tulips indoors to enjoy? Pick up a New Hampshire-grown, organic bouquet at your local farmers’ market. In the North Country, Tarrnation Flower Farm of Sugar Hill grows more than two thousand tulips in their unheated greenhouse. 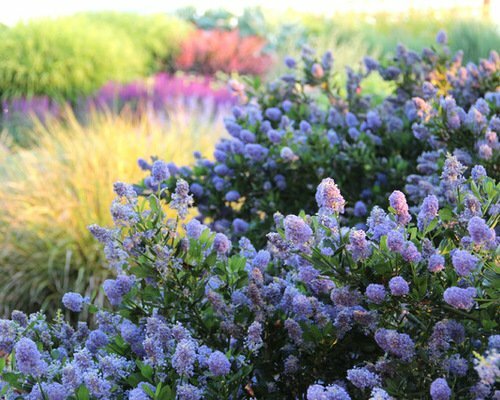 “They start blooming mid-late April, but this is always dependent on the weather,” says co-owner Vanessa Tarr. The bulk of the tulips are dug up, bulb and all, right before their buds start to color and are stored in the cooler for up to six weeks. “When they are needed, I simply cut the bulb off and place the stem in water. They will open from there and have a long vase life for the customer,” Tarr says. If some tulips are still left when Tarr-nation Flower Farm opens on Memorial Day weekend, they will accompany other spring blooms for sale, including narcissus, lilac and lily of the valley. Tulips in bud are ready to open when the sun comes out. The chapel in the background is across the street from Fuller Gardens in North Hampton. For a field trip to see acres of tulips in bloom that doesn’t involve a trans-Atlantic flight, head to Wicked Tulips Flower Farm in Johnston, Rhode Island. 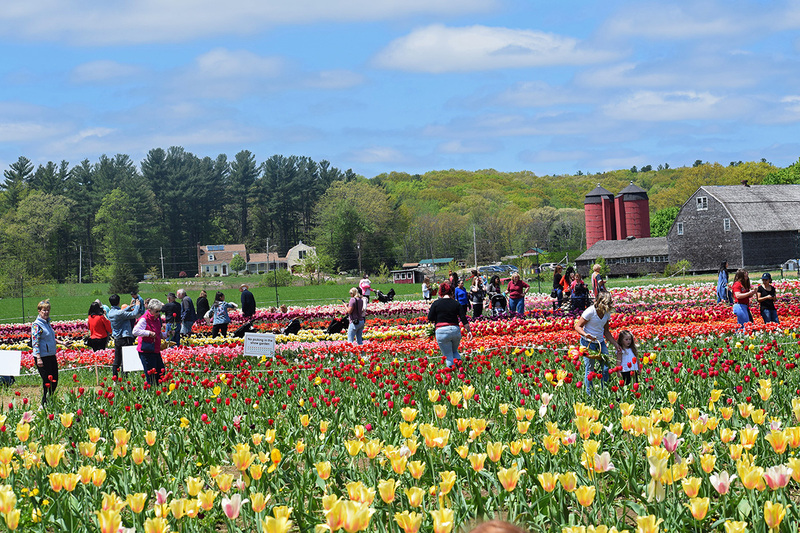 This is the largest pick-your-own tulip field in New England with more than six hundred thousand bulbs planted on five acres. 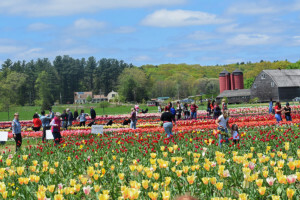 Wicked Tulips Flower Farm is such a popular destination that you need an advance ticket, sold only online, to get in. There is a limited number for each day, and those tickets sell out fast. The crew at Wicked Tulips has crowd control down to a science. Entry into the tulip fields is quick and efficient; the tulips are well-labeled and instructions on how to pick them are given. Volunteers in bright orange shirts are everywhere to make your visit as enjoyable as possible. In the fall, you can purchase bulbs from Wicked Tulips as well. Wicked Tulips is the only certified-organic tulip bulb grower in the United States, and sells only organic U.S. and Dutch bulbs. If you are giving a gift bouquet, different color tulips have different meanings in the language of flowers. Red signifies true love and passion. Purple symbolizes royalty, prosperity, elegance and admiration. White apologizes and asks for forgiveness. It also offers condolences, and denotes purity and new beginnings. Pink shows affection, gives congratulations and wishes good luck. Orange offers understanding and appreciation. Yellow used to mean unrequited love and jealousy in Victorian times, but has undergone a modern reboot and now expresses cheerful thoughts, such as hope and friendship, as well as get-well wishes.